Last winter was one in which significantly warmer-than-normal temperatures prevailed in the Mid-Atlantic region largely as a result of a strong El Nino event in the tropical Pacific Ocean, but it also featured a blockbuster blizzard that boosted seasonal values to well above normal levels in the DC-to-Philly-to-New York City corridor. It looks like the Mid-Atlantic region is going to experience a much different winter this year with respect to temperatures as it should turn out to be colder-than-normal as weak La Nina conditions in the tropical Pacific Ocean have replaced the strong El Nino. As far as snowfall is concerned, total amounts this winter are likely to reach near normal to slightly above normal levels in the I-95 corridor. In addition to the big change in temperatures, another big difference this year should be a much quicker start to winter-like weather conditions. The last couple of winters featured quite warm Decembers compared to normal, but that is not likely this year as a big flip in the overall temperature pattern to colder should take place during the middle or latter part of November. There are two areas of interest in the all-important Pacific Ocean regarding sea surface temperature anomalies that are likely to play an important role in upcoming winter weather conditions around here. The first area of interest is the equatorial region of the Pacific Ocean to the west of South America and the second area of interest is in the northeastern region of the Pacific Ocean to the south of Alaska. Last winter, both of these regions featured much warmer-than-normal sea surface temperatures. In the tropical Pacific Ocean, one of the strongest El Nino events in the last fifty years was in full throttle during last winter season. In fact, the strong El Nino of last winter was one of the main driving factors in the unusually warm weather experienced here in the Mid-Atlantic region. In the northeastern Pacific Ocean, an extensive area of warm water that developed several years ago persisted through yet another winter season. While the far-reaching area of warmer-than-normal water persists in the northeastern Pacific Ocean as we approach this upcoming winter season, big changes have taken place across the tropical region. In the tropical Pacific Ocean, weak La Nina conditions have replaced the strong El Nino conditions of a year ago and they are expected to last through the upcoming winter season with an El-Nino Southern Oscillation (ENSO) index near -0.5. Weak La Nina winters increase the odds of a cold winter for the Mid-Atlantic region thanks to weaker (warm) tropical forcing influences and improved chances for cold air patterns (due to high-latitude atmospheric blocking jet stream situations). In other words, the tropical Pacific Ocean should be far less important this winter in its impact on the eastern US due to its expected weak (La Nina) status and other factors may play more important roles (e.g., high latitude blocking, northeastern Pacific Ocean). Warm water in the northeastern Pacific Ocean can actually lead to cold air outbreaks in the eastern US, but its influence last winter was simply overwhelmed by the historically strong El Nino in the tropical Pacific Ocean. Specifically, persistent warmer-than-normal water in the northeastern Pacific Ocean during the winter season can lead to cold air outbreaks in the eastern US since it tends to favor the formation of a bulge to form in the jet stream over the west coast as an upper-level ridge of high pressure develops. This, in turn, promotes a dip in the jet stream downstream in the eastern US which helps to promote the delivery of cold air from the northern part of Canada. This large area of warmer-than-normal water in the northeastern Pacific Ocean has persisted since the cold winters of 2013-2014 and 2014-2015. In addition to the analysis of oceanic sea surface temperature anomalies, it is important in longer-range forecasting of winter season conditions in the Mid-Atlantic region to evaluate the prospects for “high latitude blocking” in the atmosphere. High-latitude blocking during the winter season is generally characterized by tenacious high pressure in northern latitude areas such as Greenland, northern Canada and Iceland. Without this type of pattern, it would be quite difficult to get sustained cold air masses in the Mid-Atlantic region during the winter season which is critical to the possibility for snowstorms. Three signals that can provide clues as to the prospects for high-latitude blocking this winter include the Arctic Oscillation (AO) index, snowpack across the Northern Hemisphere, and solar activity levels – all three support the notion for high-latitude blocking patterns to be quite prevalent during this upcoming winter season which favors colder-than-normal weather in the eastern US. High-latitude blocking is tracked by meteorologists through indices known as the Arctic Oscillation (AO) and its closely-related cousin called the North Atlantic Oscillation (NAO). The Arctic Oscillation refers to opposing atmospheric pressure patterns in middle and high latitudes. When the AO is positive, for example, surface pressure is low in the polar region and this helps the mid-latitude jet stream to blow strongly and consistently from west-to-east keeping Arctic air locked up in the polar region. When the AO index is negative, there tends to be high pressure in the polar regions (i.e., high-latitude blocking), weaker zonal winds, and greater movement of polar air into the middle latitudes such as the Mid-Atlantic region. While the AO and NAO indices are primarily used during by forecasters during the winter season, trends in the fall season can provide important clues about the ensuing winter season. Specifically, negative AO index values in October typically translate to negative values during the following winter season and the trend this October has been on the negative side. In addition to the Arctic Oscillation signal, snowpack in the Northern Hemisphere during the autumn season has also been found to be an important predictive factor with respect to high-latitude blocking patterns during subsequent winter seasons. Snowpack in the Northern Hemisphere is critical in the formation of cold, dense air masses in source regions that are important to the eastern US such as Canada and even across the North Pole in places like Siberia. In fact, research studies have actually pinpointed the region in Siberia below 60°N during the month of October as critical with respect to the likelihood of high-latitude blocking atmospheric patterns during the following winter season. If snowpack is above-normal and consistently expanding during October in that part of Siberia, research studies and empirical observations suggest there is an increased chance for more frequent high-latitude blocking configurations in subsequent winter months. In fact, there has been a significant increase in snowpack across Siberia during the first half of October including in the region south of 60°N (white area in maps below). In addition, the Northern Hemisphere as a whole experienced above-normal snowpack at the end of September ranking it as the 18th highest snow cover in the last 48 years and this is a favorable factor as well for high-latitude blocking events. Research and empirical observations have shown that low solar activity tends to be correlated with frequent high-latitude atmospheric blocking patterns and we are now experiencing one of the weakest solar cycles (#24) in more than a century. Furthermore, this already weak solar cycle is headed rapidly towards the next solar minimum - usually the least active time in a given cycle. In fact, the last solar minimum from 2007-to-2009 registered the quietest period in at least a century. The “analog years” plot (below) shows upper-level height anomalies in previous low solar activity years (i.e., during solar minimum phases) and high pressure tended to dominate near Greenland and Iceland (orange, red regions) which typically leads to sustained cold air outbreaks into the eastern US. Based on the actual results of these previous low solar activity years, odds would favor high-latitude blocking scenarios this upcoming winter season given the strong likelihood for low solar activity to continue. In addition to the evaluation of “current” oceanic and solar cycles, it is quite useful for longer-range forecasting purposes to find “analog years” in which there were similar oceanic and solar cycles compared to today. Indeed, I believe the winter seasons of 1995-1996, 1985-1986 and 1954-1955 featured somewhat analogous sea surface temperatures in the tropical Pacific Ocean (i.e., weak La Nina) and low solar activity compared to today and they can provide us a clue as to what type of winter we may experience around here. One significant difference that is likely this year compared to the previous couple of winters has to do with the timing of the initial onslaught of persistent winter-like cold weather conditions. In the winter of 2014-2015 and especially during last winter (2015-2016), winter-like weather conditions began late in the season. In fact, December of 2015 saw monthly temperatures as high as 13.5° above normal in the Philly metro region and 11.5° above normal in DC. 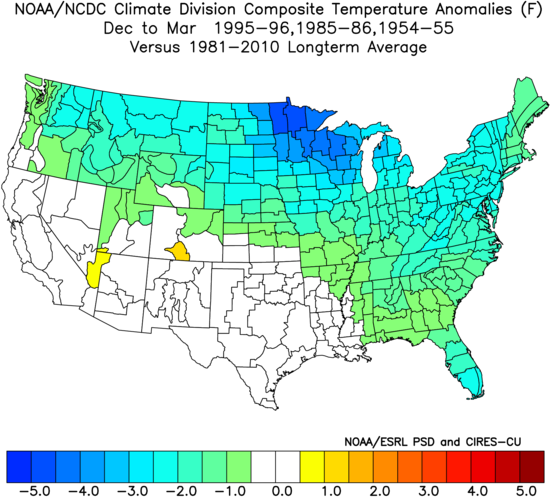 A comparison of month-to-month temperature anomalies in the three selected analog years supports the notion that this winter will get off to a much quicker start than the previous couple. After a warmer-than-normal October, November is likely to bring a flip in the overall temperature pattern from warm-to-cold – likely during the middle or latter part of the month. As a result, the time period from Thanksgiving to Christmas could very well contain cold air outbreaks and even some accumulating snow this year – a much different story compared to last year. Once the cold air becomes established, analog year comparisons suggest it could hold rather consistently right through the entire winter season. 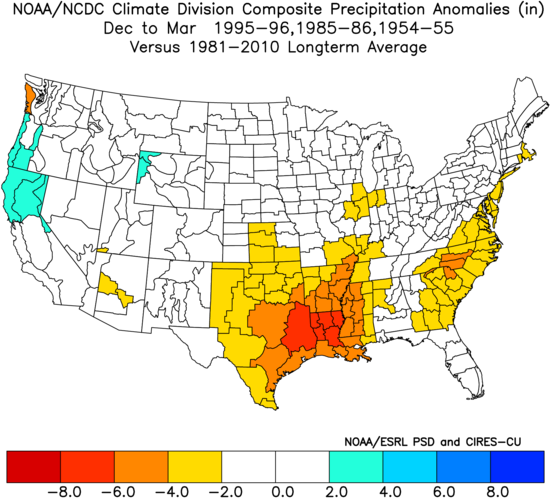 As far as precipitation is concerned, these three analog years featured on average near-normal amounts along the I-95 corridor which - given expected colder-than-normal temperatures - should translate into near or slightly above normal amounts of snowfall for the I-95 metro regions from DC-to-Philly-to-New York City. Last winter featured an energetic southern branch of the jet stream – mainly as a result of the strong El Nino in the tropical Pacific Ocean – and this contributed to some strong coastal storms along the east coast. While there certainly can be some coastal storm activity this winter, the threat for blockbuster type nor’easters is somewhat diminished compared to last year without the strong El Nino conditions in the equatorial waters of the Pacific Ocean. Given the expected oceanic sea surface temperature patterns around the world (weak La Nina in equatorial Pacific Ocean, warmer-than-normal northeastern Pacific Ocean), the likelihood for low solar activity and frequent high-latitude atmospheric blocking events, I believe the Mid-Atlantic region from DC-to-Philly-to-New York City will experience colder-than-normal temperatures on the order of -1.5°C to -2.5°C and snowfall amounts should be in the near normal to slightly above normal range with 15-25” in DC, 20-30” in Philly, and 25-35” in New York City (slightly higher amounts in the northern and western suburbs). Unlike last year when December was extremely warm (e.g., +13.5° in Philly, +11.5° in DC), the temperature pattern this year should flip to noticeably colder levels during the middle or latter part of November following the warmer-than-normal prior part of the fall season and this flip should result in a much more winter-like period between Thanksgiving and Christmas compared to recent years to likely include cold air outbreaks and even some accumulating snow.